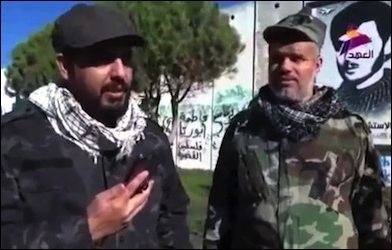 The leader of the Iranian-backed Iraqi Shi'a militia Asaib Ahl al-Haq, Qais al-Khazali (left), at the Lebanese-Israeli border. Last Saturday, a recording emerged of an Iraqi Shi'a militia leader called Qais al-Khazali visiting the Lebanon-Israel border area. The short video shows him in the company of two other uniformed men. They are in the village of Kafr Kila, which is adjacent to Metulla. I'm here with my brothers from Hezbollah, the Islamic resistance. We announce our full readiness to stand as one with the Lebanese people, with the Palestinian cause, in the face of the unjust Israeli occupation, [an occupation] that is anti-Islam, anti-Arab, and anti-humanity, in the decisive Arab Muslim cause. And, inshallah, all goodness and blessings to the mujahideen all over the world. And blessings and goodness to the Islamic resistance, which is ready to heed the call of Islam to pave the way to the State of Allah's Justice, the State of the Possessor of Time [the Mehdi], peace and prayers be upon him. Khazali is the leader of an Iran-supported force called Asaib Ahl al-Haq (the League of the Righteous). In the manner preferred by the Iranians, the organization doubles as an armed militia and a political party. It was prominent in the Shi'a insurgency against the US and its allies just over a decade ago. 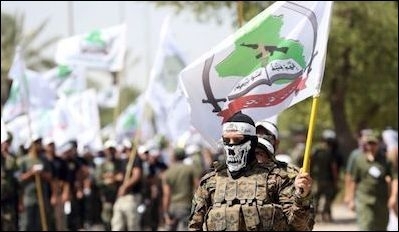 Today, AAH is a key component in the Hashd al-Sha'abi (Popular Mobilization Units), the gathering of Shi'a militias raised up in the summer of 2014 to fight Islamic State when the Sunni jihadists were gunning for Baghdad. AAH has also played an important role in the Assad regime's war in Syria. The emergent unity of purpose of Iran-supported forces in the Levant and Iraq is focused on Israel. Khazali's visit had only a mild echo in news coverage of the region this week. The fallout from President Donald Trump's declaration confirming Jerusalem as the capital of Israel continued to dominate the headlines. Arguably, however, the appearance of an obscure, bearded Iraqi Shi'a militia leader a short distance from the town of Metulla was an indication of a trend of greater potential concern to Israel than the small demonstrations held by Palestinians in Jerusalem and the West Bank to protest Trump's decision. The trend in question is the emergent unity of purpose of Iran-supported military-political organizations in the Levant and Iraq, and the emergent focus of attention of these groups – all directly controlled by the Islamic Revolutionary Guard Corps – on Israel. AAH is one of three veteran Shi'a Islamist groupings that form the backbone of the 120,000-strong Hashd al-Sha'abi. The other two are the Badr Organization, led by Hadi al-Ameri, and Kataib Hezbollah, led by Abu Mahdi al-Muhandis. AAH is the smallest of these three groups and is in many ways the most radical. Splitting from Moqtada al-Sadr's Mahdi Army in 2004, when the latter ordered his men to cease fighting the Americans, AAH claimed responsibility for over 6,000 attacks on coalition forces in the period 2006-2011. AAH elements took part in the 2006 Second Lebanon War, alongside Hezbollah. AAH claimed responsibility for over 6,000 attacks on U.S.-led coalition forces in Iraq from 2006 to 2011. Following the killing of five Americans in the Shi'ite town of Karbala in March 2007, Khazali was arrested by the coalition. Ali Musa Daqduq, a Lebanese Hezbollah adviser with the Iraqi Shi'a militias, was apprehended with him. Khazali was released in exchange for Peter Moore, a British computer consultant kidnapped by AAH. Following the US withdrawal in 2011, AAH entered the political process. It has worked and continues to work closely with former prime minister Nuri al-Maliki and his faction of the ruling Dawa Party. At the same time, AAH opened an office in Beirut and continues its close cooperation with Hezbollah. Despite its current visibility, the organization is shy of contacts with the Western media. On a project in Baghdad to profile pro-Iranian Shi'a militias in the summer of 2015, this reporter found AAH to be the only group to refuse all requests for interviews. This despite its possession of a seat in Iraq's parliament in 2014. So why do Khazali and Asaib Ahl al-Haq matter? Khazali's appearance at the border is the latest and most graphic demonstration that Israel can no longer consider its long standoff with Hezbollah as a closed conflict system between a state and a small, albeit well-armed militia. Iran has now breached the boundaries of this system. 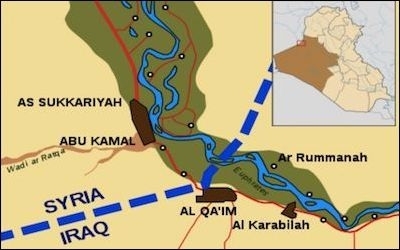 Abu Kamal, the last link in the Iranian land bridge from the Iraq-Iran border to the Mediterranean, was captured by Iranian-backed forces in November. On November 19, pro-Iranian Syrian and Iraqi forces completed the capture of Abu Kamal, a dusty town on the Syria-Iraq border 640 km. east of Quneitra. In so doing, Iran secured its land route from Iran through Iraq and Syria, to a few kilometers from the Quneitra crossing. It also secured a road for the supply of Hezbollah. Iran is taking orders neither from Russia, nor from the nominal Syrian government of Bashar Assad in its activities in Syria. Rather, with thousands of militiamen on the ground in the country, it is building its own independent infrastructure. This includes the facility at al-Kiswa, 13 km. south of Damascus, bombed by Israeli aircraft on December 2. Iranian personnel are also present closer to the Israeli border. In Iraq, as the war against Islamic State winds down, the Popular Mobilization Units is establishing itself as a permanent armed force. Already a year ago, its continued mobilization was confirmed by law. Now, components of the PMU are securing their status as political forces, ahead of the Iraqi elections scheduled for May. The Badr Organization was licensed to take part in the elections 10 months ago. On November 6, AAH also received its license from the Iraqi Higher Elections Committee to participate in the elections. Using the kudos gained by their role in the war against Islamic State, and while maintaining their military capacity, these parties are set to perform well. And in cooperation with former prime minister Maliki, they may well emerge as the dominant force in Iraq after the elections. Iranian clients are now in a position of unchallenged dominance in Iraq and Lebanon. All this has the slight flavor of déjà vu about it. On a smaller scale in Lebanon, similar Iranian clients who knew how to combine military and political activity are now in a position of unchallenged dominance of the country. So put all this together – the achievement of the Iranian land corridor through Syria to Lebanon and the Israeli border, the burgeoning political and military strength of Iran's proxies in Iraq, the Iranian efforts to push their presence and infrastructure to the border with the Golan Heights – and the potential scope and look of a future conflict between Israel and the Iran-led regional bloc becomes clear. All this is taking place, by the way, at a time when the West is busy practicing politics in Iraq and Lebanon, backing supposedly moderate and certainly toothless figures such as prime ministers Saad Hariri and Haider al-Abadi. Seen against this background, Khazali's tour of the area north of Metulla is the latest item of evidence confirming the growing boldness, broadening dimensions and advancing agenda of the Iranians in Iraq and the Levant.